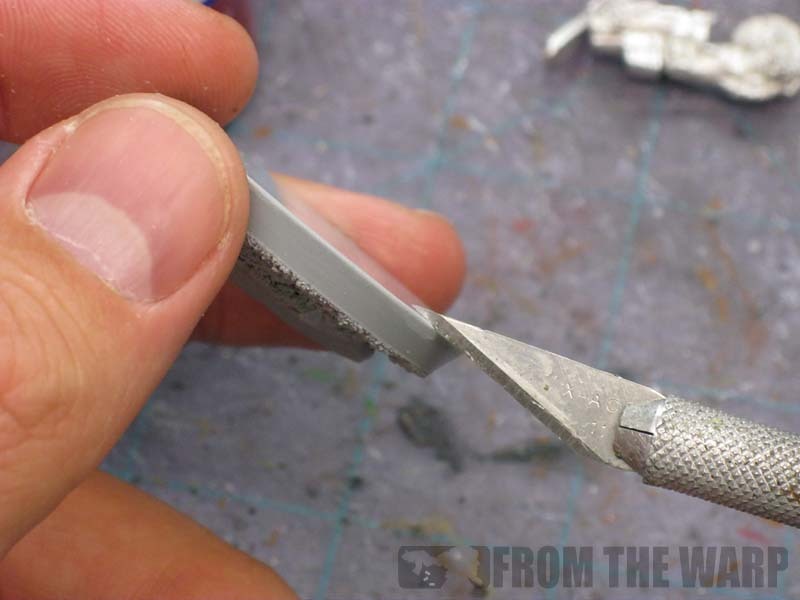 Using resin bases doesn't have to be mysterious or some difficult process reserved for those few willing to risk it. Nowadays, I use resin bases for almost all of the models I do. Either my Client has requested them or I add them in there as a nice touch to the model. So lets get right to it and look at the process I go through when I get a resin base I plan on using for a model. As far as tools, I use a regular X-Acto blade for the majority of my prep work, but sometimes I'll toss in a file for some finer cleaning. The picture above shows what I mean. On some bases, there is a bit of material that hangs over the edge. If you like the look, you can leave it on there, if not, trim it away for a nice clean upper edge. Usually it's just a stray piece here or there that hangs over and looks messy. By cleaning it up, you can get a more "finished" look. Here's where most of the work is for me. I take my X-Acto blade and work all the way around the edge of the base cleaning up the beveled face. You need to hold the blade at the correct angle or you start rounding off the bottom edge if you're not careful. Just like the previous step, I now go along the bottom of the base and clean up the underside. 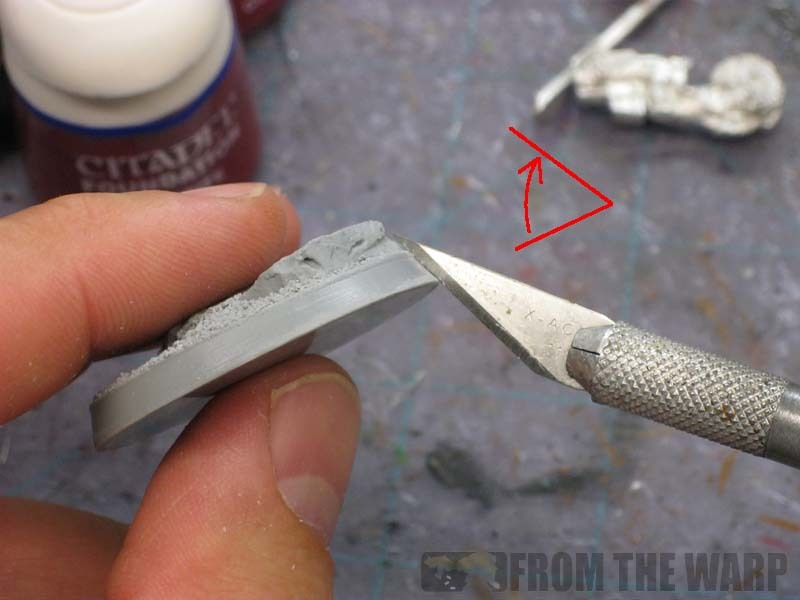 Most resin bases seem to have a bit more material around the edges and a recessed middle area on the bottom. It's not much, but it can make the base rest in an awkward position if not taken care of. I tend to focus along the edge where the bottom meets the beveled facing. This makes sure the edge is nice and clean and the base will rest flat on the ground when done. Here's where I go through and clean up any areas on top that might have imperfections. Things like extra material I want trimmed away or air bubbles that need to be cut out. If I know how I want to position my model, I'll set him on it and see if I need to cut anything away so the model will "stand" on the base properly. After that, I give the base a good washing like I do with all resin I work with. The only thing left to do after this is to fill in any imperfections (larger air bubbles) with a bit of greenstuff as needed. 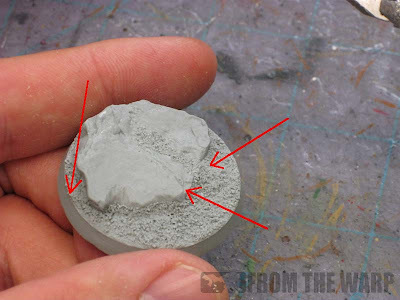 It's not much and takes only a few minutes per base, but adds so much more to the "finished" look of the base. I've found it looks much cleaner in the end after doing these few things. Good tips. I've not ventured into the realm of resin bases yet for fear I'll get hooked on them. 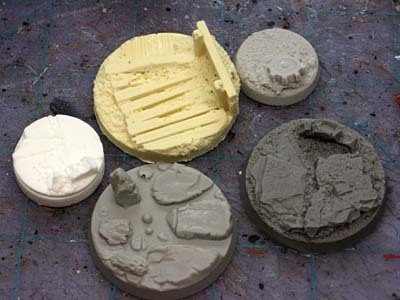 I'm a huge fan of resin bases, thwarted only by their general expense. Saying that, the resin bases from Dark Art Miniatures are really quite good, and very reasonably priced! I'd post pics of some of their stuff I've used, but it seems like I can't within a comment. The Inner Geek: Really? I figured you would have given it a try by now already. It's not like you're new to working with resin by any means. oink: Very true. Dark Arts does have some nice bases that are fairly inexpensive to boot. As for adding pics to a comment, I don't know how to do that either. I can add links, but I don't know about pics. I've been using resin bases extensively for my most recent army and I'm loving it. It adds immensely to the look of the models, especially if you have a theme going. Mr Saturday: Very true. It's just a matter of trading what kind of work you're willing to do. 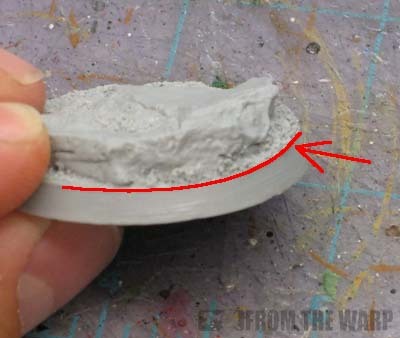 While you don't have the work of creating your bases when you go the resin route, you do have the work of prepping them correctly. Pair the right style base up with a cool model and you can get some killer combinations.